Just south of Des Moines in Indianola is the National Balloon Museum. The museum is dedicated to educating the public on the history and current developments in the science and sport of ballooning. Founded in 1972 and officially incorporated in 1977 the museum had temporary homes around Indianola until the current facility was built in 1988. A 4,400 sq. ft. expansion in 2003 doubled the floor space for its exhibits and collections. 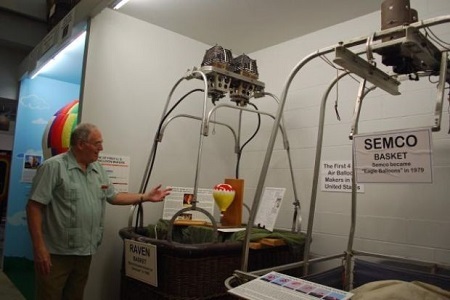 Dennis Nicholson, assistant curator at the National Balloon Museum explains one of the many exhibits showing different types of gondolas used in ballooning. “The reason the museum is located here,” said Dennis Nicholson, assistant curator, “is that in 1970 the U.S. National Hot Air Balloon Championships came here. They started that in 1963 in Kalamazoo, Michigan.” He said the event was held in Michigan for 3 years. “Then they skipped 3 years. Then in 1970 it came here and stayed here for 18 years,” said Nicholson. He said the championships now move to different parts of the country every three years. Dennis Nicholson, assistant curator at the National Balloon Museum stands by a display of a hydrogen balloon flown by Tracy Barnes who set a world altitude record with the craft in 1964. The balloon soared to a height of 37,820 feet. 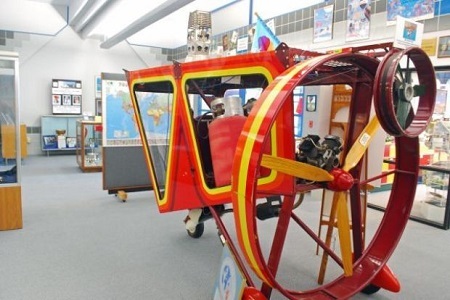 One display in the artifact filled museum tells the story of the first balloon flight. It happened on September 19, 1783, in France and had 3 probably unwilling passengers, a duck, a sheep and a rooster. The designers of the balloon, the Montgolfier brothers, Joseph-Michel and Jacques-Etienne apparently didn’t want to risk the life of a human passenger on this unknown and possible perilous journey. The silk and paper balloon was placed over a fire pit and when the hot air filled the balloon it soared into the air with its passengers in a basket suspended below the balloon. Then when the air inside the balloon cooled it returned to earth with no ill effects to the barnyard passengers. About a month later on October 15th a tethered balloon carried scientist Jean-Francois Pilatre De Rozier to the dizzying height of 250 feet. The next month De Rozier and a companion the Marquis d’Arlandes completed the first free flight of a balloon with human passengers and soared to 500 feet and traveled about 5 1/2 miles in 20 minutes. 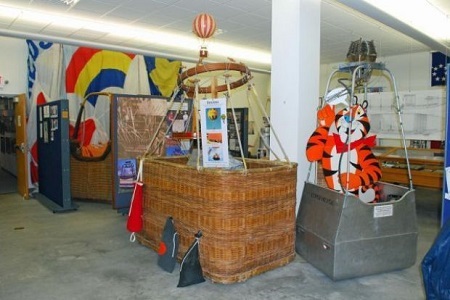 The National Balloon Museum has several large display areas filled with artifacts and displays about the sport and science of ballooning. Displays in the museum chronicle the development of both hot air and gas balloons used for scientific experiments or sport. Those displays include milestones in balloon history such as 1785 when De Rozier made the first crossing of the English Channel in a balloon. The first balloon flight in North America happened on January 9, 1793, when Jean-Pierre Blanchard made a 45 minute flight from Philadelphia to Gloucester County, New Jersey. One of those watching the launch of the balloon was none other than George Washington. Balloons also played a vital role in wars and were used from the U.S. Civil War through World Wars I and II for reconnaissance, transportation and communication. One display in the National Balloon Museum is a cylinder that was part of the “Balloon Cannon Act” and featured Florence Allen inside the cannon suspended under a balloon. Florence would then be “shot” out of the cannon and parachute safely back to earth. 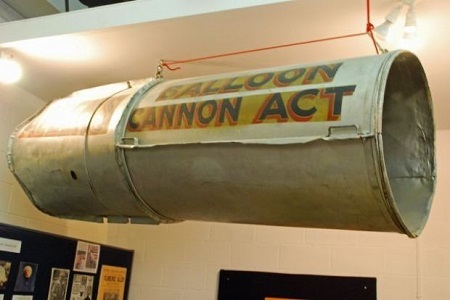 One unusual display at the museum is a large cylinder labeled, “Balloon Cannon Act” that was part of the “Flying Allens”, a family act that included dad Eddie who was billed as Captain Eddie, son Eddie Jr. and daughters Gloria and Florence. Captain Eddie made his first balloon ascent in 1912 at the tender age of 16. Years later his family joined the act and the “Flying Allens” performed at fairs and air shows around the country. Their balloon was a large muslin bag that was filled with black smoke from a fire often made of burning tires. A volunteer ground crew held the balloon down until it was completely full of heated air. Then they would release it and the balloon would rise into the sky. The “Balloon Cannon Act” featured Florence inside the cannon suspended under the balloon. Florence would then be “shot” out of the cannon and parachute safely back to earth. The era of modern hot air ballooning began October 22, 1960 when Paul E. (Ed) Yost completed the maiden flight of his new design. 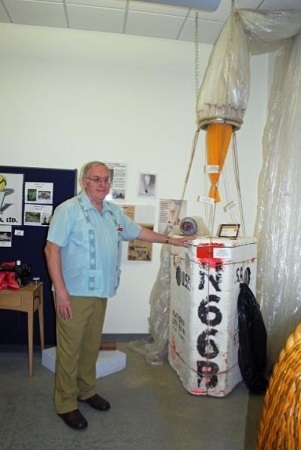 A display in the museum shows the balloon had a new type envelope and incorporated a propane burner system. Nicholson said Yost along with Don Piccard made balloon history with the new design in 1963 when they crossed the English Channel from Rye, England to Gravelines, France in April of that year. One of the more unusual gondolas on display at the National Balloon Museum is the Cameron, a two-seat version that was used with the hot air airship “St. Louis”. The balloon envelope is shaped like a blimp. The two flyers were suspended under the balloon on a gondola that was a curved board with two propane tanks attached. That history making gondola is now at the museum in Indianola. 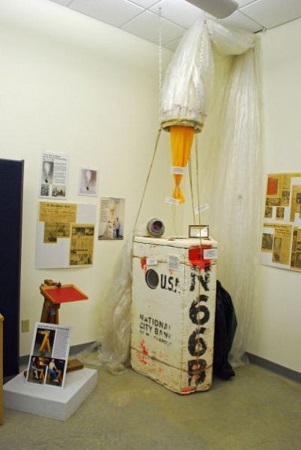 “This exhibit had been in the Forbes’ Family Balloon Museum in France,” said Nicholson, “then around 2003 or 2004 he (Ed Yost) asked for it to be moved here.” Prior to its arrival at the National Balloon Museum and after some minor restoration the balloon was inflated one final time in October 2005 at the Albuquerque International Balloon Fiesta. 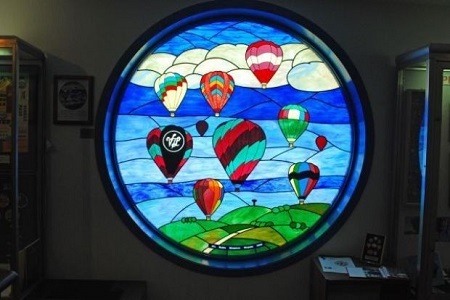 A 6-foot stained glass window in the National Balloon Museum honors the memory of Jill Ruben a local balloon pilot, museum board member and volunteer who died in October 2000. The window was designed by Indianola artist Grant Dyer. The museum also has a reference library with books, magazines, clipping and other material related to balloon and its history that are available for researchers to use The gift shop in the museum has a large selection of balloon related items ranging from clothing to DVDs and books. For more information about the National Balloon Museum visit their website at nationalballoonmuseum.com or call 515-961-3714. 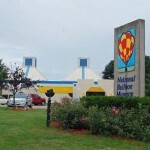 The National Balloon Museum in Indianola, Iowa, is dedicated to educating the public on the history and current developments in the science and sport of ballooning. 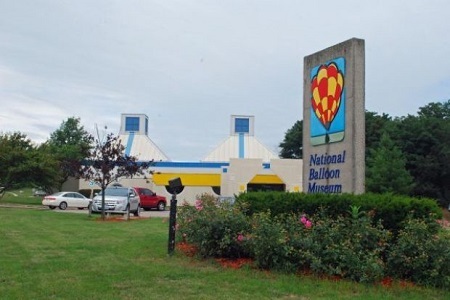 The National Balloon Museum is located at 1601 N. Jefferson Way (Highway 65/69 North) in Indianola, Iowa. The museum is open May through November from 9 a.m. to 4 p.m. Monday through Friday, 10 a.m. to 4 p.m. on Saturday and 1 to 4 p.m. on Sundays. From December through April the museum is open every day from 1 to 4 p.m. and closed on all major holidays.